Steve Fowler of Focal Point Glassworks sent us a photo of the finished Blue Heron sidelite. He created this panel using lead came. 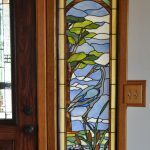 Beautiful job and such great glass choices! Thank you for sharing it, Steve!